Career as a Confederate spy In November 1861, Harrison was discharged from the Militia and eventually became a spy for CSA Secretary of War, James Seddon. In April 1863, Harrison met James Longstreet during the Battle of Suffolk. From that point on, Harrison provided information for Longstreet, which usually proved to be reliable. Also, to maintain the loyalty of his prized spy, Longstreet frequently paid Harrison in U.S. gold coins and/or greenbacks. On the night of June 28, 1863, Harrison came to General Robert E. Lee with information about the Union positions. Lee had never heard of Harrison before, yet he came compliments of Longstreet, who had known Harrison since the beginning of that year. In addition, Longstreet's chief of staff, Moxley Sorrel, said that Harrison "always brought true information." In the end, Harrison's information was plausible enough for Lee to halt his entire army. Harrison reported that the Union had left Frederick, Maryland, and was moving northward, which was true. As a result of Harrison's information, Lee told all of his troops to converge on a small Pennsylvania town, Gettysburg, effectively selecting the site of the Battle of Gettysburg. Lee even said after hearing the news from Harrison, "A battle thus became, in a measure, unavoidable." After Gettysburg, Harrison operated mostly in the North, gathering intelligence while living in New York with his newly wed wife, Laura Broders, yet none of his future intelligence ever matched the importance of his discovery in the days before the Battle of Gettysburg. 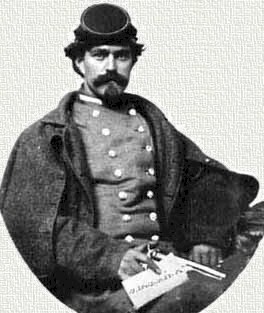 Henry Thomas Harrison, a Confederate spy, supplied Generals Longstreet and Lee with details about the advancing Union army. Based solely on that information, Lee ordered his dispersed army to move immediately towards a small crossroads town in south-central Pennsylvania. Thus was the beginning of the historic three-day battle known as Gettysburg. We can only imagine what might have happened if Harrison had failed in his mission but it is a fact that he did change the course of history.